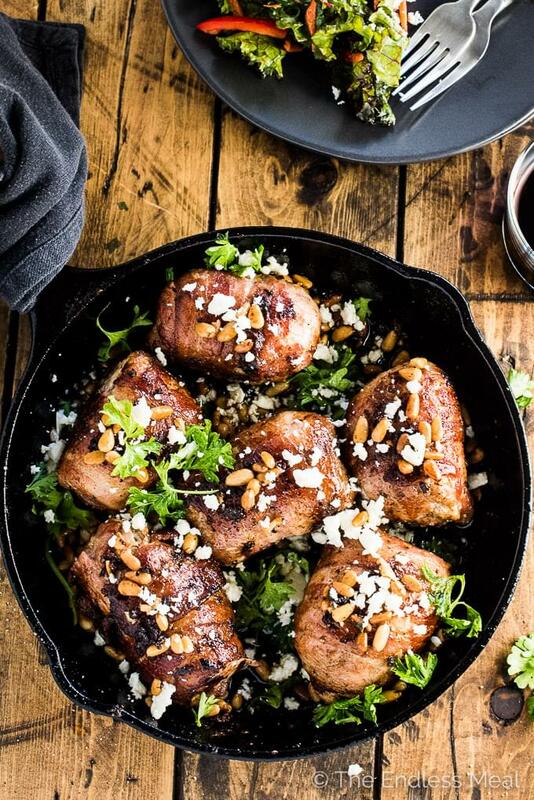 This Mediterranean Chicken is stuffed with feta cheese, sun-dried tomato pesto, and black olives, wrapped in salty bacon and pan fried till crispy. It's a surprising simple to make and totally delicious dinner recipe that is fancy enough for a dinner party yet easy enough to make for a weeknight meal. Three words: bacon. bacon. bacon. Is there any other word we really need in life? I didn't think so. Bacon is where it's at. When I'm dreaming up recipes to share with you guys I normally have three guide words I follow: healthy, easy, and delicious. You probably guessed that as those are likely the three most commonly used words here on this little blog. Now I know that bacon might not fit into the healthy category for most of you, but we can't deny that it's delish and easy to make. Making some wiggle room in the healthy part of this. This Mediterranean chicken recipe all started with a visit from my mom. Whenever she comes to visit she always takes over in the kitchen (awesome) and makes us crazy delicious dinners (extra awesome!) Last time she was down she stuffed chicken breasts with some cream cheese and tarragon and wrapped it in bacon. I've been dreaming up new bacon wrapped chicken combos ever since. 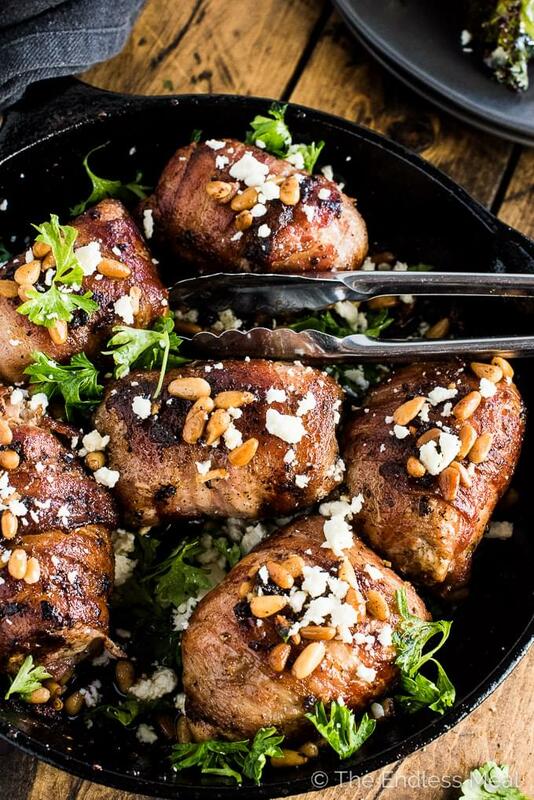 Enter Mediterranean chicken … it's stuffed with feta cheese, sun-dried tomato pesto, and black olives then wrapped in salty bacon and pan fried till crispy. 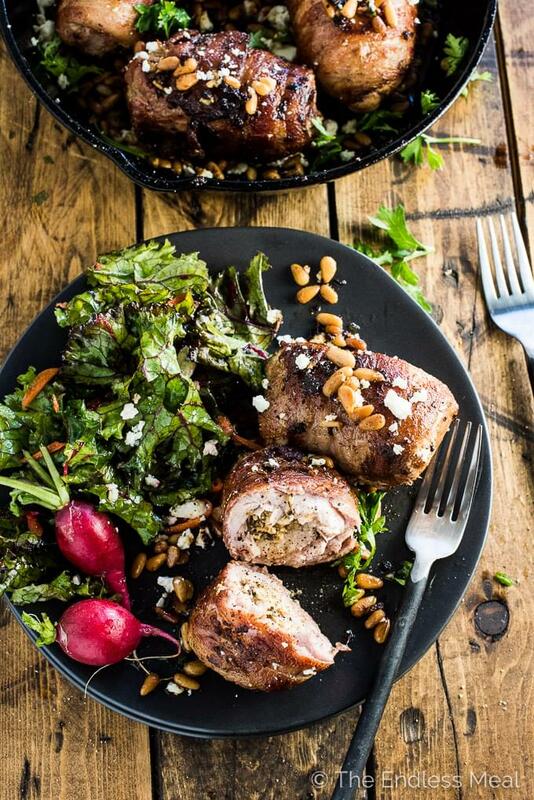 Throw in a handful of pine nuts to toast at the end and dinner is served.